If you were a 1902 postman and asked the men of Grosse Pointe Lightship or after 1911, LV75, their address, you would hear a long address. They would tell you that they lived above twenty feet of water, almost directly in the center of Lake St. Clair, at the northeast end of the straight channel, seven miles above Windmill Point Light, nine miles from the head of Belle Isle, and nine miles from the lower lights on the piers of the St. Clair ship canal. On a clear day the light ship was visible almost the entire length of the lake because it was painted a bright red. The black day mark jutted out starkly far above the deck and at night the lights of LV75 were hoisted aloft and penetrated all points of the compass. Johnson Boiler Company of Ferrysburg, Michigan built the lightship in 1902 for the Coast Guard at a contract price of $14,998. The ship was a steel scow with a single lantern mast forward, a large wooden deckhouse and no means of propulsion. It was 83’9” long, had a 23’0” beam and weighed 160 gross tons. Illuminated by oil lamps, it had a hand operated fog signal. In August 1902, as LV75, the Coast Guard placed it on the Grosse Pointe station marking the upper or northerly end of the twenty foot dredged channel in Lake St. Clair. When the Great Lakes were closed to navigation, usually from early December to March or April of each year the light ship was moved from the station so that crews could maintain and repair her. John T. Murray was the first master of LV 75 from 1902 to 1903 and Charles Calnow was master from 1903 -1906. 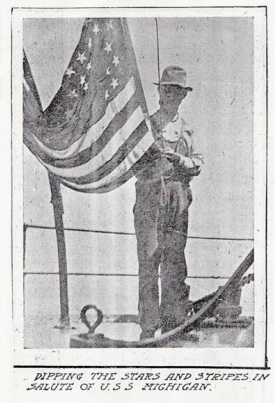 During his watch, a Detroit Free Press reporter and photographer visited the lightship and left a story and photographs in the Detroit Free Press for the historical record. The nameless Detroit Free Press reporter and photographer spent a day aboard the Grosse Pointe Lightship interviewing the crew and taking pictures. The four crew members told the reporter that the summer months aboard the lightship were uneventful, but spring days on Lake St. Clair could be rough. Joseph Dezardner, 53, was listed as mate in the log of Light Vessel 75 or the Grosse Pointe Lightship and was the veteran in the four member crew. In keeping with his twelve year hitch on the lightship, he knew every inch of the light vessel from stem to stern and from the top of the spar to the bottom of the hold. Captain Charles Calnow spent 24 consecutive years in the employ of the United States Government, compared to Joseph’s 21 years, but Joseph spent more years on the light vessel. Joseph was born on the Gulf of St. Lawrence, 129 miles from Quebec, with salt and fresh water in his blood. He left home to become a sailor when he was just 12 years old and shipped on brigantine merchants ships in the ocean, visited tropical ports, and acquired an extensive first hand knowledge of Puerto Rico. While sailing in the brigantine, Joseph narrowly escaped being shipwrecked on the rocks of Madeline Island on a black and gale blowing night. In his French dialect Joseph related how the moon broke through a rift in the clouds for a few seconds, just long enough to show the breakers ahead and the dark smudge of the coastline further back. The captain changed course and the brigantine headed for open water, but Joseph said that the moon was all that saved them. When Joseph came to the Great Lakes, he entered the United States Government service on the lighthouse tenders Warmington, Dahlia and Marigold. He went on the Grosse Pointe Lightship twelve years ago and ever since it has been his station. He was listed as mate on the payroll, but is a jack of all trades. By preference, he was cook on the lightship. He took care of the big lamp, looked after the oil and fuel, was chief swipe during the scrubbing times and was at the head of the paint brush squad when the ship was given a new coat of paint. Joseph spun some yarns about life on Lake St. Clair.. He remembered when a 1899 “big blow broke loose” and a naphtha launch with 14 men ran for the lighthouse for shelter. The waves capsized the boat and it sank, leaving the men struggling in the water. The men on the lightship hauled the shipwrecked men aboard until the storm subsided and they were picked up by a passing steamer. Another vivid memory of Joseph’s involved six Detroiters – four women and two men-that the lightship crew saved. A storm sunk their boat and threw them into the water. Again, the lightship crew came to the rescue and cared for them until they could be sent home. Joseph recalled returning home to visit after a nineteen-year absence. His sisters, who had been girls when he left, had grown up and married, and one even had become a grandmother. He had a dozen nieces and nephews who had heard of him, but did not know the full story of his life as an able seamen. He spent much time yarning to them. As far as Joseph was concerned, Lake St. Clair was one of the Great Lakes. “It sure kicks up storms and acts like the rest of them,” he said. In 1911, the Grosse Pointe Light Station was moved and renamed Lake St. Clair Lightship. In 1926, it was equipped for unattended operation and in 1935, equipped for controlling all systems, In 1941, was sold and reported to have been used as a lighter in New York Harbor. It was supposedly still in use in 1983. Joseph Dezardner would have chuckled and nodded knowingly at the longevity of Grosse Pointe Lightstation or Lake St. Clair Lightship or the lighter in New York Harbor.